Does Crowdability offer equity crowdfunding? What are the benefits in using Crowdability? Where do Crowdability users come from? Why do I have to register on funding portals to see the details of the deal? How much can I invest in the start-ups I see on Crowdability? What does current and previous investor mean? Does the JOBS Act impact Crowdability? Does Crowdability follow securities regulations? How old do I have to be in order to use Crowdability? How can I contact Crowdability? How does Crowdability choose the platforms and portals from which it selects investment opportunities? What's the relationship between Crowdability and the platforms that appear on the site? How does Crowdability make money? 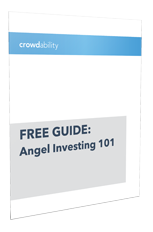 Where do the accredited investors on Crowdability come from? How does Crowdability choose which start-ups to feature? How can my company get featured on Crowdability? Does Crowdability charge a fee to start-ups? For the first time since 1933, every U.S. citizen can now invest in private equity transactions including start-ups. That’s 100 million investors who control $30 trillion in investable assets. Individuals will be lured by the high potential returns – but with little experience in the private markets, they're putting themselves at risk of losing money. Crowdability aims to protect these individual investors by providing them with education, software, and independent research. Essentially, what Morningstar has done for mutual funds, we aim to do for private equity. Crowdabilty was founded by Matt Milner and Wayne Mulligan. It's based in NYC. As entrepreneurs over the past two decades, Matt and Wayne saw first-hand the challenges of finding financial support to grow a new business. Many start-up founders are forced to ask their “friends and families” for money, or they're forced to make the rounds pitching angel investors or professional venture capitalists. This is a time-consuming and often painful process. At the same time, we saw that everyday citizens were passionate about high-growth products and investment opportunities, but didn’t know how to get involved; for the past 80 years, only wealthy "accredited" investors have had the legal right to invest in private transactions like start-ups. But now, thanks to the JOBS Act, all U.S. citizens have the right to invest in the private companies they believe in -- and to reap the rewards if these companies become the next Twitter or Google. For individual investors, Crowdability makes the process of investing in private equity investing less risky, more efficient, and, hopefully, more profitable. “Crowdfunding” is an emerging online trend where many individuals collectively fund projects. In exchange for their financial investment, these citizens receive an ownership stake in the company. In this way, if the start-up becomes successful -- if it goes on to become "the next Facebook" or "the next Microsoft" -- investors will share in the financial upside. Crowdability does not offer equity crowdfunding. It is not a funding portal or broker-dealer. Crowdability is a financial media company. It educates individual investors about this emerging market, curates the highest-quality investment opportunities from around the web, and offers independent analysis and research. What are the benefits of using Crowdability? As equity crowdfunding continues to gain momentum, new online platforms that connect start-ups with potential investors are emerging every day. Hundreds of these platforms have already launched -- and many more are coming -- but each of them showcases only a handful of investment opportunities. That makes it difficult and time-consuming to identify and invest in the best companies. Crowdability curates investment opportunities from the highest-quality platforms across the web, places them in one central location, and provides context and insights into each one. In addition, we offer education and various services to help individual investors make better-informed investment decisions. Where do Crowdability's users come from? Crowdability’s management team has previously built subscription content businesses that catered to hundreds of thousands of individual investors. Now we're leveraging our past relationships and experience to attract new subscribers to Crowdability. We do this via editorial partnerships, content syndication, and paid media. Contact sales@Crowdability.com to inquire about sponsorship opportunities. Nearly all of the content on Crowdability's website and newsletter are free. That includes new editorial several times a week written by Matt and Wayne, our Resources pages for videos and white papers, and our deal aggregation services. For those seeking deeper insights and actionable recommendations, we also offer premium paid offerings. Does Crowdability charge fees to start-ups or online funding platforms? No, Crowdability does not and will not charge any fees to start-ups or funding platforms. As an independent financial publisher, we maintain no relationship with the issuers or platforms. We simply aggregate data from the universe of funding platforms and deliver this data to our subscribers so it's succinct and convenient. Crowdability currently offers several premium paid services, including its in-depth online education course, The Early-Stage Playbook, and its private "stock-screener," CrowdabilityIQ. How does Crowdability choose the funding platforms from which it selects investment opportunities? Crowdability aggregates deals only from the platforms that comply with the SEC’s rules -- for example, the platforms that do background checks on a start-up's founders, and validate the start-up's financial and legal standing. We especially appreciate the funding platforms that align their interests with the interests of individual investors -- for example, by directly tying their compensation to a start-up's success. Start-up companies are brought to the attention of Crowdability through funding portals such as SeedInvest and AngelList. Some of these portals have Investment Committees that conduct due diligence and determine the viability of the start-ups. They typically select private early-stage technology, tech-enabled, or consumer-based start-ups that are incorporated in the U.S.; have teams of at least 2 or 3 people who've passed background checks; are targeting big markets; and are displaying signs of traction or growth. Not every company that applies to be on a funding platforms is accepted; generally speaking, only about 1% to 5% are accepted. Notwithstanding this process, neither Crowdability nor the platforms recommend specific investment opportunities as being suitable for any specific member. There are many risks to start-up investing which you should carefully evaluate with your financial advisors. Ultimately, you are responsible for conducting due diligence independently, and you should only make investments that are in your comfort zone. Yes, investing in startups is risky. Many start-ups go out of business every year due to changing market conditions, unforeseen challenges, and other problems. By providing valuable data, education and insight to our subscribers, we hope to help you reduce this risk. But make no mistake, early-stage investing is inherently risky. Crowdability doesn’t maintain a relationship with the issuers or funding platforms. To find out specific details on each opportunity, you'll need to log into the funding platform that's hosting the investment. That being said, according to the rules of the JOBS Act, the SEC places limits on how much investors may invest into each deal (as a percentage of their net worth or annual income), and/or how much they may invest in total into start-ups annually. If you have less than $100,000 of annual income or net worth, you may invest $2,000, or 5% of your annual income or net worth, whichever is more. If you have more than $100,000 of annual income or net worth, you may invest 10% of your annual income or net worth, whichever is less. Regardless of your income or net worth, during any 12-month period, the total amount of Title III securities you can invest in can’t exceed $100,000. In each Title IV deal you’re interested in, you can invest up to 10% of your net worth or 10% of your net income (whichever is greater). If you are accepted by one of the platforms that Crowdability features, it’s likely that your start-up will also be featured here. What does “Current” and “Previous Investors” mean? "Current Investors" are investors that are investing on the same terms as you’ll receive in this round. "Previous Investors" have invested in a different funding round, on different terms to those currently offered. Why do I have to register on the funding portals to see details of the deals? In order to view details of -- and invest in -- any of the companies listed on Crowdability, each user must provide information about themselves. This includes whether or not they're an "accredited investor," and if so, which of the accredited investor requirements he/she meets. According to the SEC, the definition of an Accredited Investor is someone with a net worth of at least $1 million, or annual income of at least $200,000 ($300,000 if combined with their spouse). To ensure that a start-up raising capital is following the law, the funding portals from which we curate deals need to certify that you’re an accredited investor; that’s why you need to register on their platforms. The JOBS Act makes it possible for start-ups to publicly announce that they’re raising money and allows them to raise money from unaccredited investors. The JOBS Act is a U.S. federal law that enables all Americans citizens to invest in crowdfunded securities. It was signed into law on April 5, 2012 by President Obama, and its various components have been going into effect ever since. In particular, “Title III” and "Title IV" of the JOBS Act allow non-accredited investors to invest in high-growth start-ups. Non-accredited investors currently make up 98% of America, so this is an historic piece of legislation. For everyday citizens, this is an opportunity to invest in businesses they believe in with as little as $100. We follow all securities regulations. How old do I need to be in order to use Crowdability? Crowdability is not intended for use by children. No one under age 13 is allowed to use the site, provide any personal information, or receive our email distributions. Minors between the ages of 13 and 17 must get the permission of their parent(s) or legal guardian(s) before viewing the Site or receiving emails. Crowdability has no official or financial relationship with the platforms. Our deal aggregation service provides investors with access to the universe of equity crowdfunding deals from the highest-quality crowdfunding platforms. We then step out of the way and allow investors to determine which of the opportunities are best suited to them. This is similar to how Google organizes the world's information, but allows its users to decide which information is most relevant. You can reach us via email at feedback@crowdability.com. Our mailing address is 205 Hudson Street, 7th Floor, New York, NY 10013. We also list this information in our universal site footer.